Before, I had valances over the windows that were installed a little higher to draw the eye up. To see the before pictures, click here. After the kitchen was painted, I decided not to put the valances back up, leaving a more open look. That left a lot of open space above the windows. I used the “EAT” art that I made above the window in the breakfast area. To see the “EAT” post, click here. To see more of the breakfast area, click here. Instead of using another sign or dishes above the other window which is above the sink, we installed a conversion kit into the recessed light. The kit was purchased from Lowes for less than $20. If you click on the picture, it will take you to their page. It was so, so easy to install! Just screw in it and adjust the length of the cord by wrapping it around the white bar. I purchased a lampshade and 2/3 yard of fabric from Wal-Mart. It was very easy to cover the shade as well. I used spray adhesive and rolled the shade on the fabric, smoothing out any wrinkles. I then trimmed the fabric around the top and bottom of the shade. I did not lap it under. After cutting 2 narrow strips of fabric, I folded and ironed it down making it like a bias tape. I finished it up by hot gluing it around the top and bottom. There’s the three soup tureens that I found recently at GW and yard sales. To see them used as a centerpiece, click here. I love the new pendant light! I've been considering do that to mine over my sink but haven't gotten around to it just yet. I love yours. The fabric is perfect! Thanks, Nancy! I probably debated over that fabric for three weeks before I purchased it! I tend to over think things! Love the new pendant light! Looks great! Thanks for showing the conversion kit for pendants. I have recessed lights down the length of my kitchen and despise them. I did not know it would be this easy. Your shade looks great! Donna, they are super easy to install! It only took minutes! I still have recessed lts over the island but I was afraid it would give the kitchen a closed in look if I changed those out as well! Looks wonderful Tammy! Love the pattern on the shade! I did this before too with my old kitchen, a quick switch and you have more loveliness! Those light kits are pretty clever! I have a pendant light and similar shades over my kitchen sink - love the simplicity of no valance or curtains. Such a clean look! Wish I had known about Lowes carrying conversion kits. 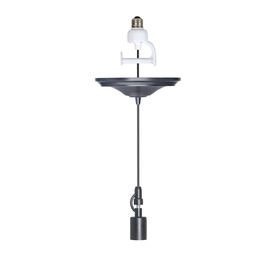 The builder of our home was charging an arm and a leg to put in pendant lighting over the counter bar in our kitchen and I had seen the ones available at Ballard Designs and opted for those. The designs are somewhat limited at BD but with the ones from Lowes it's virtually up to what you like. Thanks for sharing! Gail, I looked at the ones at Ballard Designs as well but wanted a different shade from what they offered. By using the kit from Lowes, it cost about $40 for the kit, shade and fabric, which is half the price of BD. I did have several shades at home I could have used but I wanted this shape and size! Wow! That light looks so nice! I never thought of hanging a lamp above the sink! You're really on to something!! Such a pretty pendant light! It looks great! OH my gosh, I love this! The light is perfect!